RAMCO is a third generation privately owned and operated company over 85 years in business offering a complete line of cleaning and degreasing systems. Systems are manual or fully automated and can accommodate water based or alternative solvent based processing routines. RAMCO has been in the business of building immersion washing systems since the 1940s with thousands of machines in the field. An experienced and dedicated staff has remained with the company over the years. Learning from a long span of experience and service, successes and failures, we have honed the most dependable long-lasting engineering designs and manufacturing formats. It is common to find RAMCO washers 20 or 30 years old still running. They are indeed built to last. RAMCO systems are used for a multitude of applications including critical in-line cleaning and high production processes where downtime is unacceptable such as aerospace, automotive and medical. Each system is built for dependable repeatability of function. They are up and running, there when you need them. And a RAMCO network of local support is there for you, backing up the product, a constant presence. 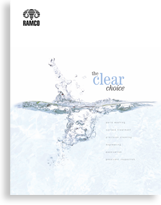 A key expertise at RAMCO is the ability to incorporate a number of distinctive washing features into a single system. By doing so we achieve results on difficult to clean parts where other systems fail. At the heart of the RAMCO system is the adroit use of an elevator within each processing chamber. The elevator is used to transport components into and out of each chamber. However, its most important function is to position and move the components producing changing flow patterns within the working zone(s). We call this Dynamic Flow Combination. It is this aspect of function that allows RAMCO systems to achieve better coverage of component surfaces, superior results and accelerated washing, rinsing and drying cycles. At RAMCO, we believe that our specialized know-how, spanning over 85 years in this industry, is a valuable asset to any customer. To that end, we’ve invested considerable time, effort and commitment into establishing, training, and maintaining an outstanding distributor network. These men and women are cleaning specialistsexperienced in process development, equipment selection, chemical selection, wash and rinse water treatment, installation, training, and support. Our combined effort is focused on providing the most modern cleaning, degreasing, and chemical processing systems at the lowest cost per part and with the highest regard for worker safety and the environment. You can look to our distributors as team members and valued advisors, guiding the process in coordination with your staff. And our expertise is simply part of the package. When you choose RAMCO, knowledge and experience are on your team, at work for you. Our business is manufacturing the best immersion parts washing systems in the industry designed to meet a wide variety of applications from simple to demanding cleanliness, cell washing to final in-line precision cleaning. Our philosophy is that personal health, safety and the environment come first and there can be no compromise or question when it comes to safeguarding these concerns. Therefore, our focus is on engineering our systems to use modern aqueous cleaning agents or preferred alternative solvents and to replace toxic solvent degreasing.